The Maltese archipelago is a European jewel that I kept reading about. Not only Game of Thrones but also beaches, nature, delicious food and lots of fun. Yet my sister had visited quite a few years ago, and kept telling me about this beautiful island… invaded by hordes of youngsters, especially in the Summer, when many of them visit Malta to attend English courses. 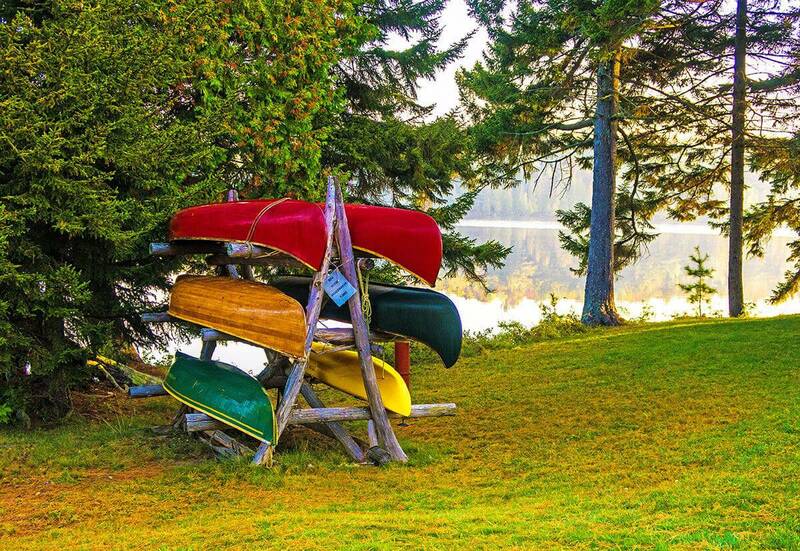 If I have to be completely honest, I felt pretty intimidated: while I still intended on discovering Europe, I wasn’t thrilled at the idea that I’d find myself trapped in some kind of Summer camp. Now I can admit I was completely wrong. I’ve discovered all the things you can do and see in Malta, met quite a few friends and of course I’ve had a lot of fun. I arrived in Malta quite late at night. It was June and the air was particularly warm. Before to leave Naples I decided that I wanted to get my own taste of Malta, keeping an open mind. I took a deep breath… and walked into an airport that was crowded with teenagers. Their smiling faces were enough to tell me that even if they had landed in Malta to study a new language, they knew they were going to have fun (yes, learning can be fun in Malta!). The taxi driver must’ve noticed my long face, because without a word he handed me a cold bottle of Kinnie. As you know, I believe that discovering Europe (and every new Country, actually) also means learning about local tastes and traditions. Kinnie was my very first taste of Malta, the thing that I used to quench my thirst… and apparently a band-aid that can sort things out, put a smile on your face or find you new friends. This bittersweet fizzy soft drink has been brewed in Malta from bitter oranges and extracts of wormwood since 1952. It’s Malta’s favourite non alcoholic beverage, and you’ll find it everywhere on the archipelago for just a few Euros. If I were you, I’d add “drink some Kinnie” to my list of things to do in Malta: you can’t escape the national soft drink. In Italy Valletta is particularly famous. Everyone kept raving about its beaches, and yet no one had prepared me to the explosion of colors I found there. While you will find some of the best beaches in Malta, I believe there’s so much more to see and do. Surrounded by colors, flowers and history, Valletta has even a few British red telephone boxes scattered here and there. The perfect backdrop for a few good Instagram shots, in case you’re into that. Valletta is the capital of Malta and one of the three UNESCO World Heritage sites on the island, along with the Hal Saflieni hypogeum and the megalithic temples (still the oldest ones in the world). Founded by the Knights of St. John in 1566, it is a late-Renaissance city located within walls strong enough to withstand any external threat. 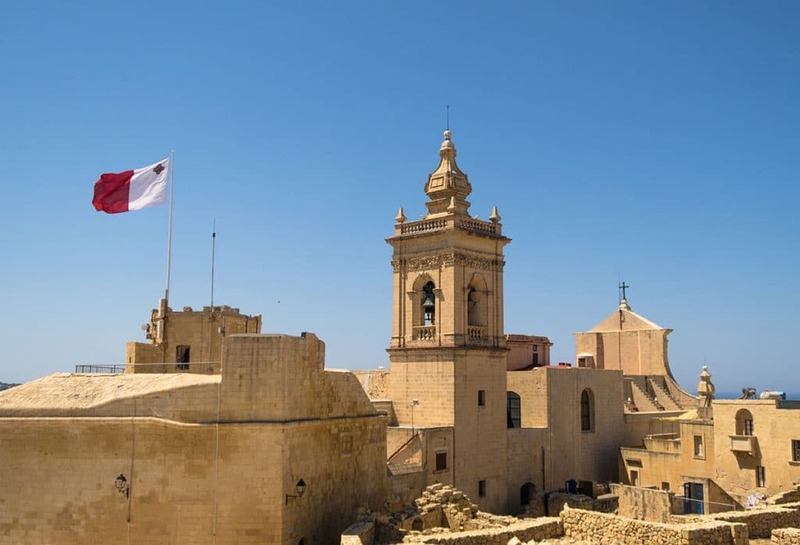 While it is possible to assert without doubt that the Maltese archipelago has been shaped by the Christian religion, this is even more evident in Valletta. In this city suspended between tradition and modernity, in fact, there are at least twenty Churches, all open and active. Religion is an integral part of Maltese life. Easy to notice if, like me, you’ll stop in these islands during a “festi“. It’s a religious celebration that involves the whole city (even the smaller towns become all colorful and lively thanks to the festi!) and that holds a special place in the heart of every Maltese. Every alley and street is decorated with colorful lights and drapes, making Malta even more colorful. The sacred statues are generally carried in a procession, followed by the locals and often by crowds of curious tourists. I must admit I felt particularly bad at not being able to stay for the procession in Valletta. Taking part to the social, cultural and religious life of a community is the best part of discovering Europe, at least for me. If you like art and history, Valletta is the place to go to. You will be able to see two paintings by Caravaggio in Saint John’s Co-Cathedral, home to the Knights of Malta. It is also possible to visit the Palace of the Grand Master, the current house of the Parliament, the Museum of Fine Arts and the National War Museum in Fort St Elmo, with exhibitions related to the military history of the Country. 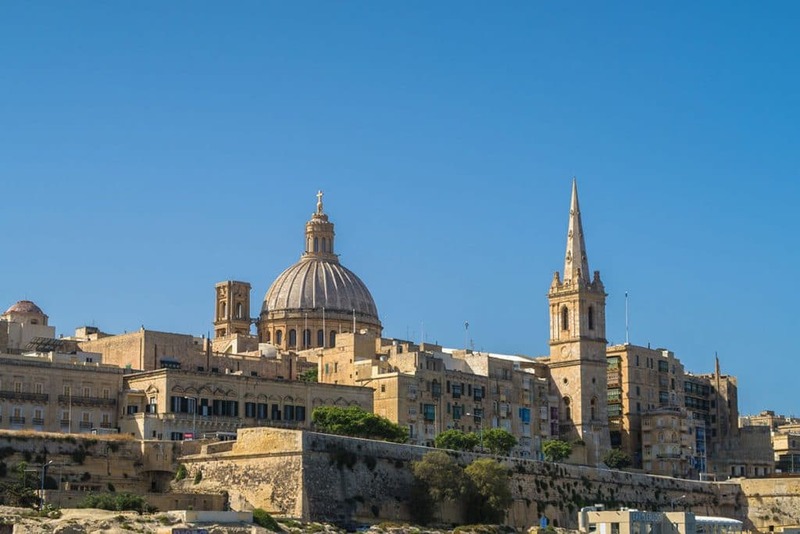 The Capital of Malta deserves at least a couple of days to visit its museums and Churches: you will be discovering Europe, and not only the Maltese archipelago, through ancient buildings, paintings and works of art. While there are many things to do in Malta, one of those I loved the most was wandering at sunset in the Lower Gardens of Barrakka. Watching the spectacular view of the Grand Harbour, on fire with the last rays of the sun is an activity I still find myself missing. From the Lower Gardens of Barrakka, I finally recognized the first one of the Game of Thrones Malta filming locations. The entrance to Fort Ricasoli in the first season of the show (episode 3, “Lord Snow“), has been in fact used as The King’s Gate, in a scene when the King returns to the city. Fort Ricasoli, together with Fort St Elmo, is just one of the many fortifications built to protect the Grand Harbour by the enemies that kept on attacking it. The Maltese island have in fact a long history, and have been often forced to defend themselves because of their strategic location. Here you can find a useful article listing all the things to do in Valletta, if you’re plannind to find a hotel there! One of the highlights I wasn’t expecting to find in the Lower Gardens of Barrakka was a neo-classical temple, dedicated to Alexander Ball, Captain of the British fleet. This quiet spot full of flowers and trees is perfect to enjoy a kinnie on the hot summer days: don’t forget to add it to your Malta itinerary! 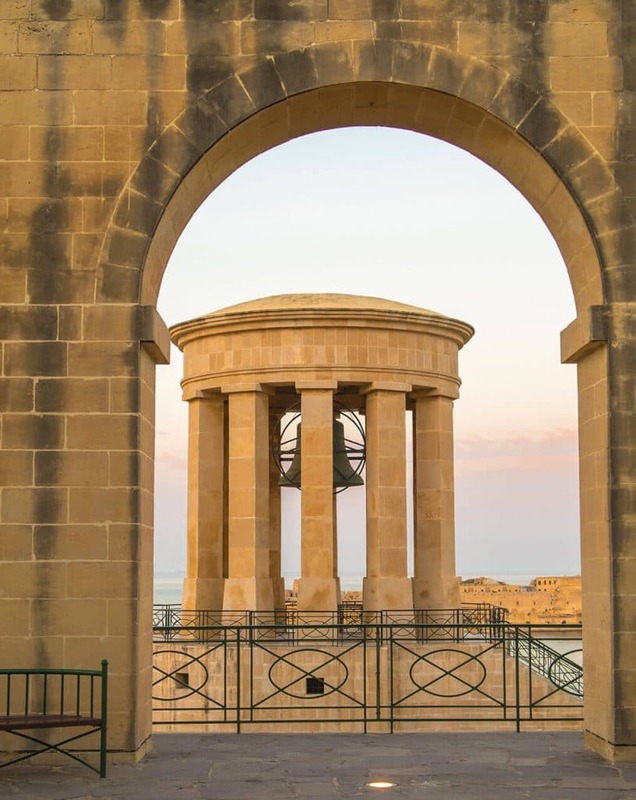 One of my shots of Malta that people loved the most on Instagram shows the Siege Bell, a memorial that honors the over 7,000 Maltese victims of World War II. This imposing bronze bell overlooking the harbor, right next to the lighthouse, was inaugurated on May 29, 1992. The bell tolls every day at noon to honor the fallen. You will be able to climb the staircase that leads to the small circular temple, to enjoy breathtaking views of the Grand Harbor of Valletta and Fort Saint Elmo and admire the great bronze sculpture that symbolizes the burial in the sea of The Unknown Soldier. As you might know I’m also discovering Europe through the historical monuments and sights in this country: even if it wasn’t a powerful experience like my visit to Auschwitz-Birkenau, I still spent a moment to listen to the bell, in silence. If you visit, I would like to ask you to be respectful. Remember that it’s a monument to remember the dead, not a mere tourist attraction! 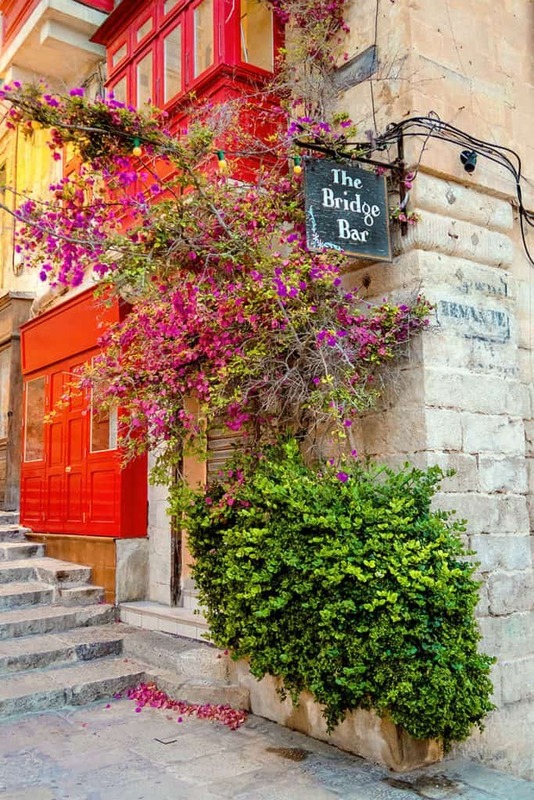 In the evening Valletta can be quite crowded, but especially in Summer it comes to life with live concerts, free Jazz sessions in small pubs like The Bridge Bar, or cultural events. We especially liked a delicious pub called StrEat Whiskey & Bistro, located in a narrow street full of shops and tiny restaurants. Going inside what looks like a stone-walled cellar, you will be greeted by friendly staff and the delicious scent of food. The walls are decorated with really beautiful modern paintings, which make the atmosphere almost surreal and very elegant, but prices are still low. A blackboard illustrates the dishes of the day and those of the month: the servings are particularly large, which is always a good thing after a day spent walking around! As I already mentioned, in Italy everyone and their mother talks about Valletta. Yet only 13 km away from the capital, you will find Mdina, the City of Silence, perched on the top of a hill. To get there from Valletta you’ll just have to hop on a bus. If the main gate of the city looks familiar… it’s because you’ve found another one of the Game of Thrones Malta filming locations: here they filmed many key scenes from the first series of the show! Stepping through the gate will definitely make you feel like walking into Westeros. Mdina is the ancient capital, and my favorite city in Malta. 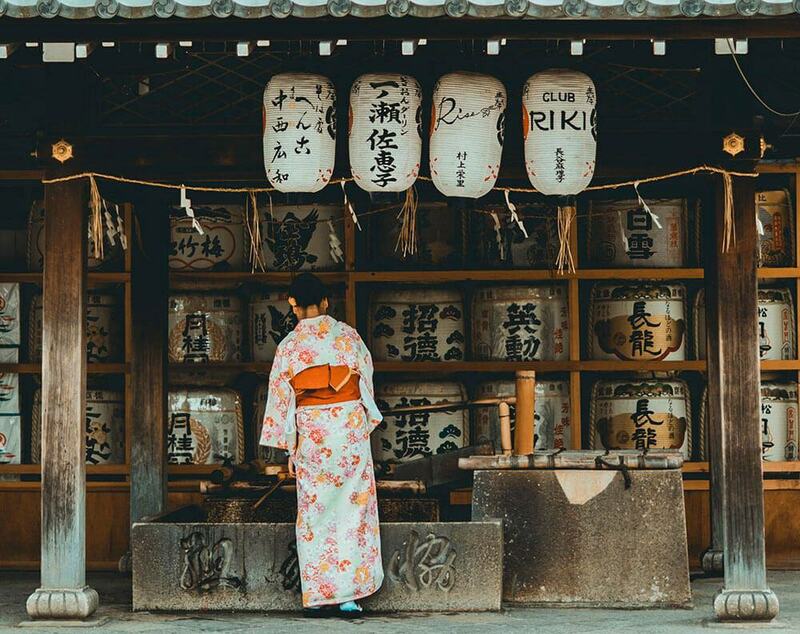 I visited in the evening, when the narrow streets were silent, as many tourists had already left, and monuments loomed over me as if they wanted to tell me their story. Mdina looks like an open-air museum, a jewel where you can get lost in what looks like a labyrinth, but honestly won’t give a fig about it. If you have enough time, make sure you visit the Mdina Cathedral: it’s definitely worth it! While Valletta is a city full of life, pubs and youngsters, Mdina is much more quiet, not as much crowded and particularly romantic. 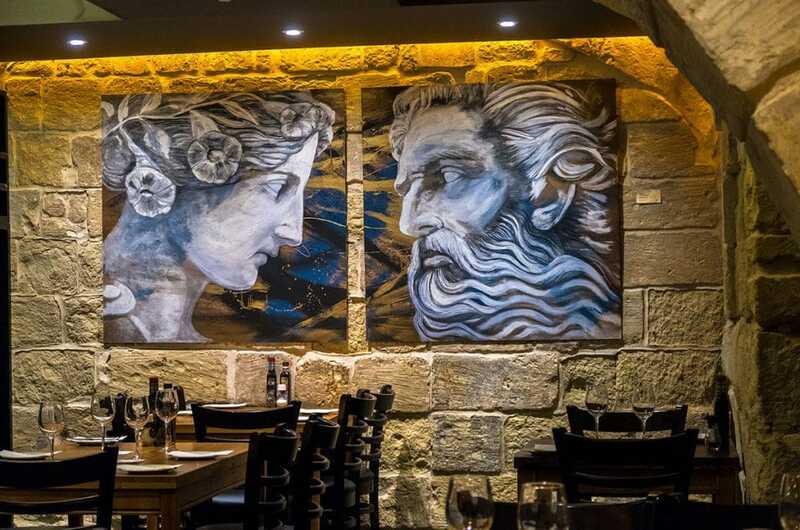 I had dinner at Vinum Wine Bar & Bistro, a unique wine bar inside a medieval building in Mdina. If you are visiting Malta with your partner, you’ll find Vinum the perfect romantic spot (maybe to propose?) to enjoy a glass of wine and Mediterranean food, hopefully “Al Fresco“. This wine bar is in fact open year round, but in the summer they offer a dining experience overlooking the Mdina bastions. If you are booking your table in advance, make sure to mention the “Al Fresco” experience to enjoy the view! In case you travel with a drone to shoot from above, don’t use it in Mdina! Because of some accidents in the past that damaged a few monuments, it is now forbidden to use these devices in the city. I suggest you always check in advance with the local authorities, to make sure you know where you can use your drone. As an Italian with a quest, discovering Europe and its people, I was pleasantly surprised to realize that people in Malta are extremely friendly, always smiling and very proud of the beauties of their own territory. In Gozo, above all, people are always ready to tell you anecdotes, let you taste a pinch of local salt or take a picture for you when they think you need help. The ferry from Malta to Gozo is free: you will only pay your 4,65€ ticket upon returning to Malta. The trip to get there is very short and still I was left speechless at the beauty of the sea. From the ferry I was in fact already able to spot The Citadel with its yellow stone and I wasn’t the only one who felt very excited. You should’ve heard the cries of joy of those around me as we approached the island! I finally understood why Gozo is called “the island of Calypso”: the legend narrates that the nymph Calypso lured Ulysses to this unspoiled island, holding him prisoner for seven years. After seeing Gozo… I started to think that maybe he just didn’t want to leave! Our group was lucky enough to find Gozo almost empty, as we arrived pretty early in the morning. Or maybe everyone was already off to the beach: because I can’t stand the crowds, I really didn’t feel like complaining! Among the many things to do in Gozo there’s of course a visit to the Citadel overlooking Rabat, also called “Kastell“. Before you hop on the free lift that will take you to the cathedral, make sure to watch the short 3d movie that tells the story of the Citadel through the eyes of a soldier who really lived there. He didn’t hesitate to sacrifice himself to try to save his fellow citizens during one of the sieges of the Turks in 1551 … only after killing his family to avoid that they had to live as slaves. When the Citadel was assaulted, in fact, the whole population, except for some elderly and disabled, was reduced to slavery. Today it is still possible, if you visit with an expert guide (ours was Joseph Micallef, born and raised in Gozo) to visit places described by the short video. At first I thought it was a 3D movie like the ones we are used to, so with glasses and “special effects“, in stead the staff lead us into a small square-sized stone room. The experience is immersive, even without wearing special glasses. Images are in fact projected on all four walls, and the dolby surround gives the impression of being next to the soldier, running around the alleyways through the Citadel. The film lasts about fifteen minutes and is free. It is definitely a good idea to add it to your list of things to do in Malta. The lift will leave you in front of the doors of the ancient Citadel. 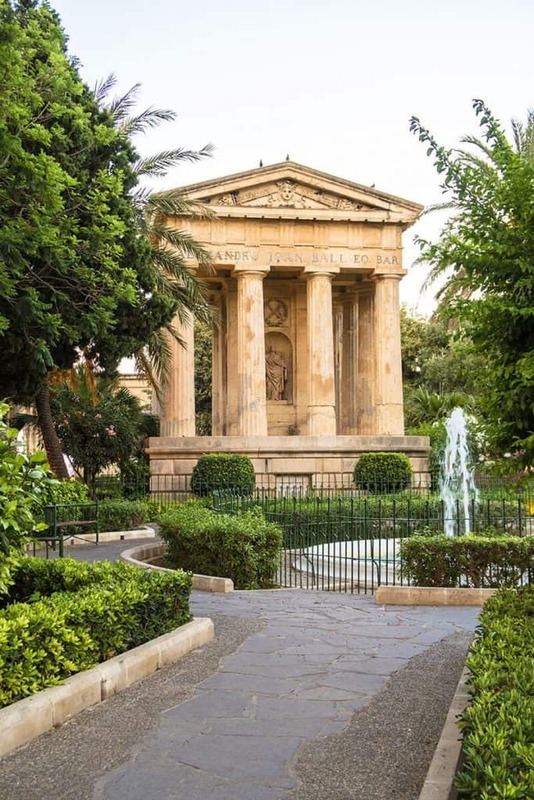 Within walking distance of the wonderful Gozo Cathedral, located where once there was the temple of the Goddess Juno. 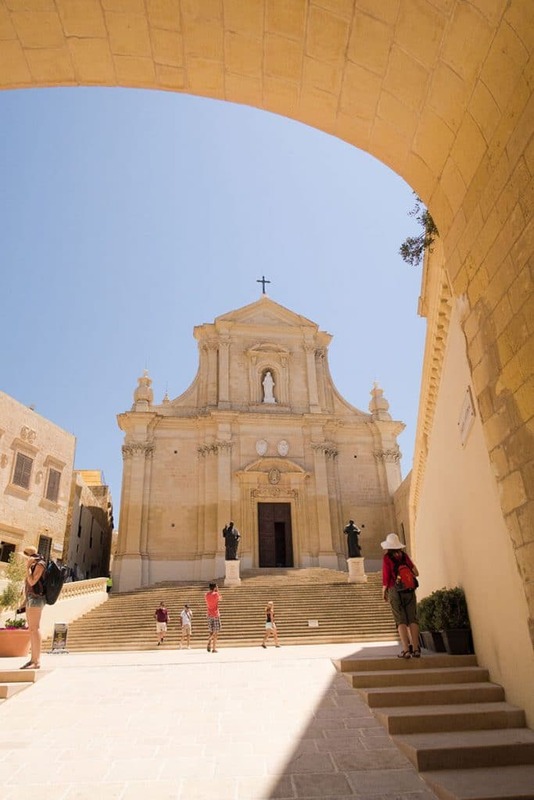 Outside there are two bronze cannons dating back to the 17th century and a large staircase that often offers some shade to thirsty tourists: Gozo, like Malta, can be particularly hot in Summer! Walking along the city walls, the wonderful streets will make you feel like being in an Arab country. It’s not overly difficult to find the staircase that leads up the fortified ramparts. Whether you like photography or not, I suggest you find some time to climb the stairs. From the ramparts you will be able to enjoy a breathtaking 360° view of the hills and valleys of Gozo, down to the sea. In the Summer, because the heat can be extreme rain doesn’t come often, the landscape will be quite desolate, but still the view is still remarkable. Our guide told me that when the sky is clear they can clearly see the beaches of Sicily from a distance: you wouldn’t believe how close we are to Malta! Near the Citadel you will also find many museums, including an ancient prison and a World War II shelter. 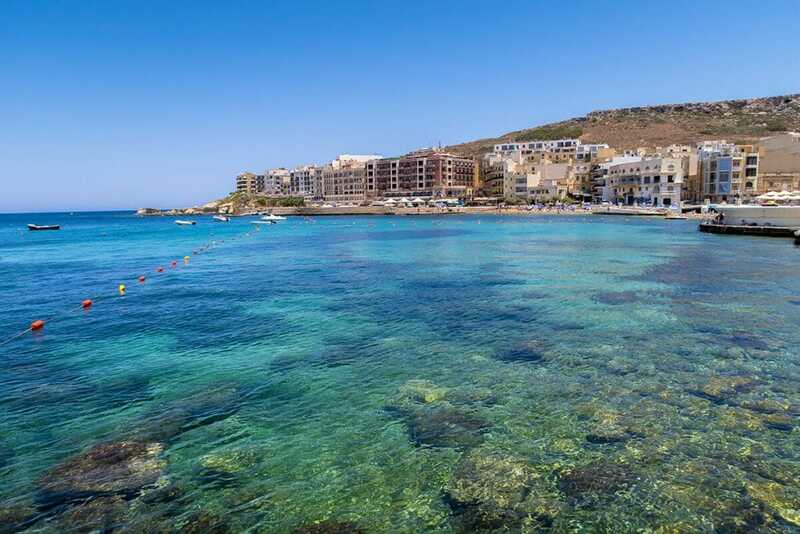 One of the most famous areas of Gozo is the wonderful Ramla Bay. 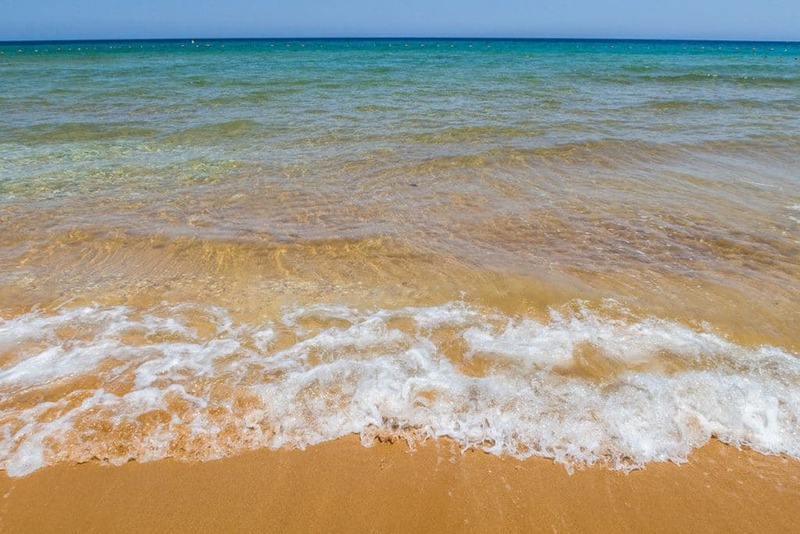 Characterized by the soft sand of a beautiful color between red and golden, unless the other beaches in Malta, it is located at the bottom of a valley in the North of Gozo. You can get there hopping on a bus from Nadur, and while it can be quite crowded, I considered myself very lucky: it was much less chaotic than Waikiki Beach! Guests have access to bathrooms and showers. Before entering the beach you will also find some small kiosks that sell drinks and snacks, if you decide to stay longer. Just as for the area in front of the Blue Hole (I’ll tell you about that in a moment), I was particularly surprised by the fact that water, soft drinks and slushes have “regular” prices. Unlike many other places in the world where the shop keepers exploit on tourism, especially on high season, here you can still pay € 2 for a slush and € 1.50 for a bottle of fresh water or a soft drink. This is yet another reason to visit Malta. I am now discovering Europe with a critical eye and it’s not so common to find a tourist area that still has “human” prices. The Maltese archipelago was such a pleasant surprise, so much so that I keep telling all of my friends: they still can’t believe it was so cheap to eat and drink on the islands! From the area around the bay the views are magnificent: on the West side of the beach you can take pictures of the wonderful Calipso cave. There is a sand path surrounded by hills that will take you there. According to the legend I told you about, it’s here in this cave that the nymph kept Ulysses! While I loved The Citadel and Ramla Bay, I couldn’t wait to see the Blue Hole. This natural rock formation, excavated over the centuries by the wind and the waves, is particularly famous among the divers. From above all you can see is what looks like a magnificent natural pool with rocks that protect people from the strong currents of the area. 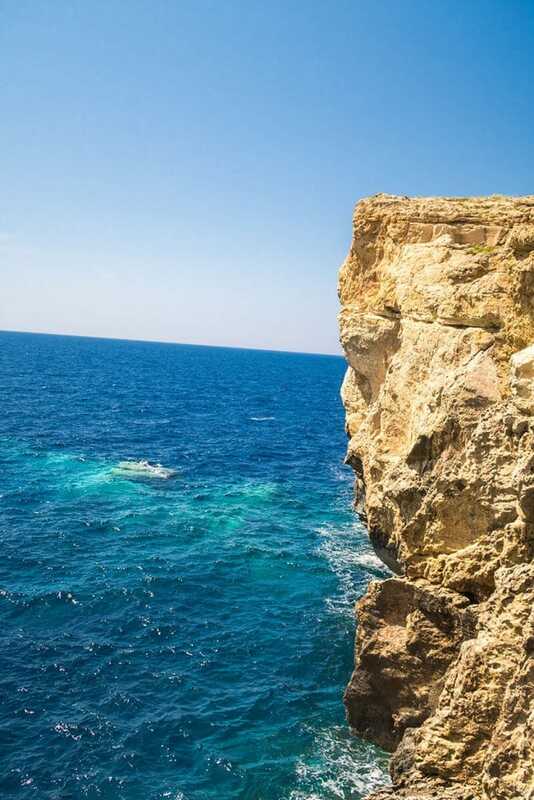 Yet there are so many people who plan their entire trip to Malta just for some diving in Gozo. There was a huge line of divers getting ready to jump into the sinkhole when I visited. While talking to a couple of them I discovered that it’s this popular because it’s not a difficult dive. The best views start at 8-9 meters underwater. This marine cave includes a stone arch with a flat top, covered with coral and fishes. Experts will also be able to explore the large cave at the bottom of the Blue Hole, to the left of the entry point, or go down to about 16 feet deep. But if you aren’t such an expert diver, you will still be able to enjoy the breathtaking views: sounded like a deal to me! I promised something to unleash your inner Khaleesi, right? Well, here you go. Next to the Blue Hole you will find another one of the very popular Game of Thrones filming locations in Malta. At first sight you won’t recognize it, but the pillar of rock pictured above once was the magnificent Azure Window, background of the wedding between Khal Drogo and Daenerys Targaryen in the first season of the show. This magnificent natural arch, well-known throughout the world, collapsed because of a violent storm with winds up to 50 knots in March 2017. In Italy we are also worried for a similar natural beauty: the ancient Natural Arch in Capri, which looks a bit like the Azure Window. A good reminder that Mother Nature can be merciless if she wants to. You can still see the cliff and the base of the arch underwater. Over the years, the latter will also be covered by the coral reef, becoming invisible from above. The collapsed arch, however, has blocked some of the passages used by divers for the longer routes. Although some people like to venture on the cliffs at the back of the little church in this area, to take scenographic photographs of the Blue Hole and of the Azure Window, I think it’s very important to respect this still fragile ecosystem. The authorities are still trying to figure out how damaged the cliff is, so it’s not a good idea to cross the security barriers to climb higher: remember that an Instagram shot isn’t worth your life! Discovering Europe has shown me so many different sights in our Country. Yet very rarely I was left speachless as when I visited the Blue Lagoon in Comino for the first time. The name of this tiny island comes from the cumin, a spice that grew on the island. Today, only an elderly couple still lives on this island, almost completely wild. There is only one hotel but there are no cars, and if you avoid the high season, it is almost completely deserted. Rather than sleeping in Comino, or reaching this island it by taking a bus and a ferry, I suggest you to enjoy this magnificent area by boat. For example, the Nautica company rents yachts of various sizes to groups of tourists, departing from the port of Valletta. There are also many galleons that go there, but if you travel with a group of friends, ask them the price for a private yacht. You can share the expenses with the group, avoiding the crowded galleons and enjoying a luxury trip to some of the best beaches in Malta with your friends. From Valletta you can reach the coasts of Comino in about one hour and forty minutes. If you rent a yacht you will also have a small fridge in which you can keep your lunch, a table to enjoy your lunch, but also kitchen, bathroom, shower and bedrooms. 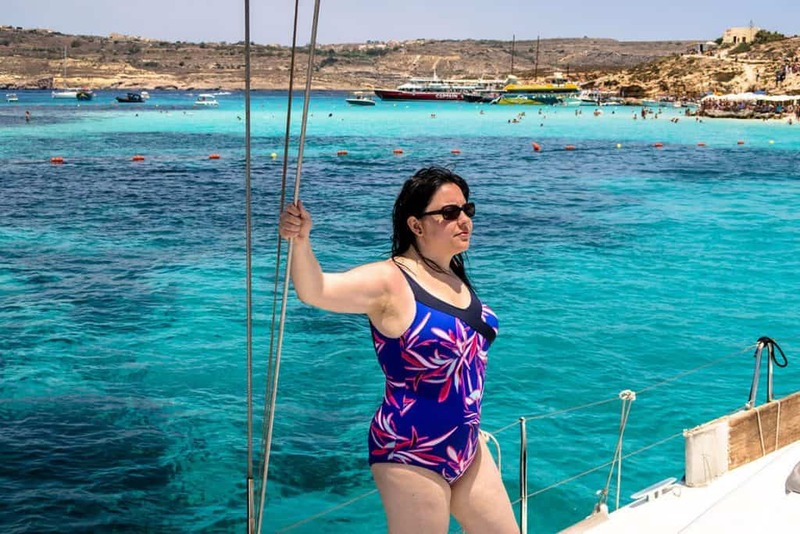 In our case, we brought with us a fresh Caesar salad for lunch and we found out, thanks to our guide, Trudi Grech, that in the Blue Lagoon there are “boating ice-cream vendors“. In fact you will see colorful freighters with large freezers roaming the area (check them out in our video linked at the top of this article! ): they get close to the other boats or to the shore, to sell ice cream. It was already very hot in July, so we definitely welcomed them with open arms! How come nobody thought of such a thing also in Capri and Ischia? If you rent a yacht, ask the Captain to stop also at the Crystal Lagoon. This less crowded cove near the Blue Lagoon is located just beyond Saint Mary’s Tower. The turquoise water is quite salty (you can take a shower on your yacht, before your skin starts itching!) but overall it feels like a beautiful, natural swimming pool. Many jump in from the high cliffs (beware, it’s very dangerous! ), and even here lots of divers go underwater to see the magnificent coral reef. If you go for a swim, however, make sure there are no poisonous jellyfishes: one of the girls in our group was caught by surprise and we had to rely on the supply of ointment that the Captain so kindly offered to help her! 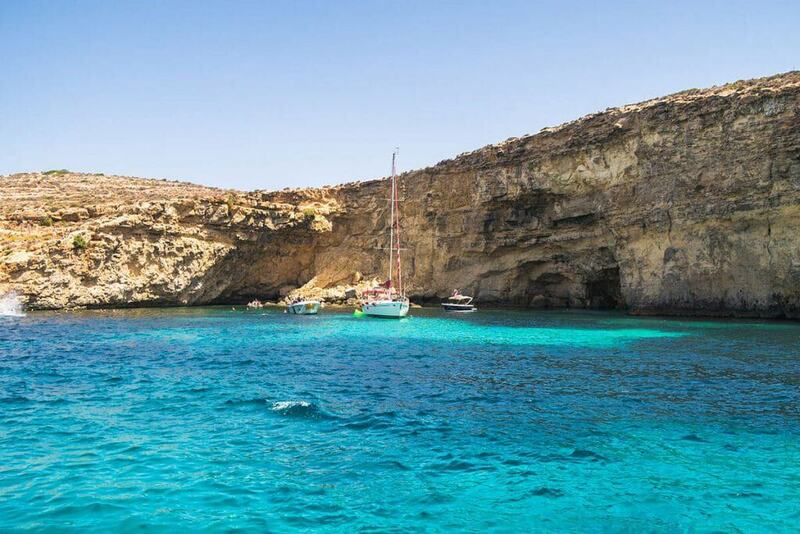 The Blue Lagoon, a few minutes away from its twin, is far more crowded and it’s the main highlight of Comino. I know, I already mentioned that it’s one of the best beaches in Malta, but to make sure you understand what I mean, I suggest you have a look at our vlog. We didn’t alter the colors at all. See how wonderful it is! The water was so blue that for a moment or two it felt surreal. I just couldn’t believe my eyes. Arriving with a yacht, especially if you visit in the less crowded period (avoid July and August) you’ll feel like stepping into another world. White sand, a paradise cove and ice cream served straight to your boat. I don’t know about you but to me it felt so decadent. Youngsters? Crowds? From the yacht I didn’t see anything aside from the views that still represent my most vivid memories of Malta. Even today I still haven’t found anything like the Blue Lagoon. Because by now you probably think I am some kind of Grinch who can’t stand the crowds or the younger peeps, I decided to surprise you with a bonus. To me it’s like the end of a journey: Malta has changed me so much. I was full of stereotyped information that weren’t true and once on the Maltese archipelago I had to admit how wrong I had been. So much so that while the crowds still scare me to death, I decided that I didn’t want to miss a music event. Every summer since 2007 at Floriana, near La Valletta, there is a free festival organized by MTV, Isle of MTV. 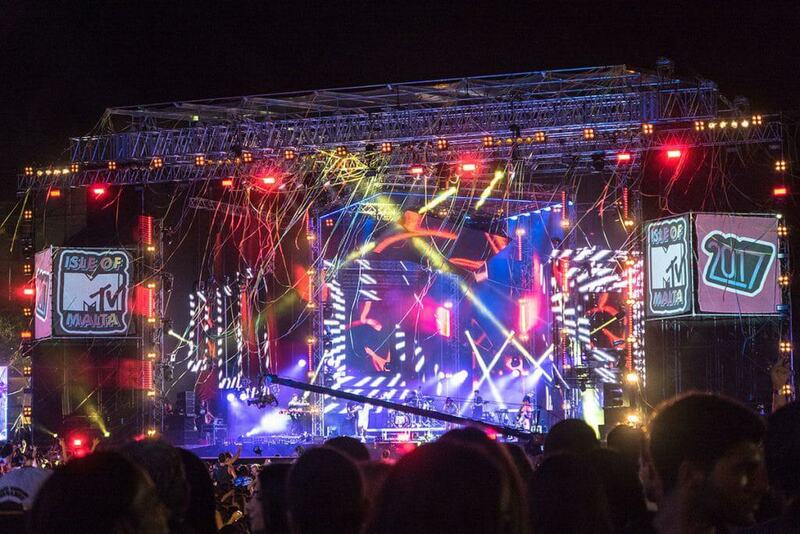 The huge concert, aired also on MTV Italia, is so very crowded. But it’s a crowd of people who have fun and dance for hours. The smiles on their faces were so big that I’m sure their cheeks hurt the following morning! With artists like Nelly Furtado, Snoop Dogg, David Guetta, The Chainsmokers or Will.i.am it’s one of the largest music festivals in Europe and it’s generally held in June or July. The artists begin to alternate on stage from 6 pm, because the concert ends at about midnight. There are no age limits and throughout the day the Malta Transport Organization offers special shuttle buses, of course crowded, but still very useful to be able to take part to this event, as the stops are all located near the entrances. You will be checked at the entrance, so avoid carrying selfie sticks or liquids, as they won’t allow you to carry them inside! For your safety and that of the others, make sure you follow the rules, so everyone can have fun! My mom still can’t believe that I’ve been to a dance festival. I got her so curious about Malta that I had to plan a trip there for both my parents. Malta? Of course: it’s the perfect destination for everyone! You can check out more things to do in Malta here. Disclaimer: I was kindly invited to Malta by the Malta Tourism Authority. While I thank them for this opportunity, all opinions expressed in this article are my own and don’t necessarily match their views. « Fairytale castle hotels in Ireland: sleep like a princess! The Blue Hole is absolutely amazing, whether you’re a diver or not so I highly suggest a stop to Gozo! It is very inspiring post in Malta covering so many aspects and giving us some serious reasons to be there. Some day would love to taste Malta specially Kinnie. I have deep interest in UNESCO sites and for that Valleta seems the apt place. So many blue beaches are there to explore, my fav would be Blue Lagoon. A very detailed article for travelers. My husband has been talking about Malta for a few years now and I’ve been on board but haven’t read that much about it. You’ve made me really want to get there soon. The whole trip sounds amazing. Ramla Bay particularly sounds and looks amazing. I’m sure you’ll have fun! I wasn’t really keen on going either but I can say now that I’m already planning to get back for more! Let me know how you liked it when you’ll visit! Malta looks absolutely beautiful – the colour of that water is something else! The crystal lagoon in particular looks idyllic – I’d love to see some coral reef but I’m not sure I’d want to high dive, I’d be too worried about injuring myself! Malta is LOVE! You really got me with that beautifully captured piece of architectures and also the beach! Indeed a perfect getaway! I also love the idea of spending vacations in a romantic place. It really is Ghia! Have you already visited Malta? What I love about Europe is the sheer range of pristine towns and villages that can be found in every corner of the continent. Malta is, of course, another revelation. All the places have their own unique old world charm. Valetta looks like a living museum, a town that seems to have come to life from the imagination of a master artist.Mdina sounds really fascinating too. It’s so true about Europe! And Mdina was definitely our favorite, but I must say that the Maltese archipelago is beautiful wherever you go! I’ve been to Malta twice and could still go back again. I love those islands…so blue, so quaint, so pretty. I also enjoyed all the fresh seafood and gozo cheeses. It’s a shame the Azure Window fell down. It was gorgeous. I feel so bad, I’d wanted to go for a long time and I didn’t make it to see the Azure Window! Thank you very much! I’m just an amateur but I think that as you said, it’s difficult to go wrong when everything is so beautiful! My parents actually lived in Malta and my older brother was born there but I’ve never been. Valletta looks especially interesting and a trip to Gozo sounds a must. Hopefully, we will get to visit very soon and have recently been chatting with Malta tourism. How beautiful is Malta! 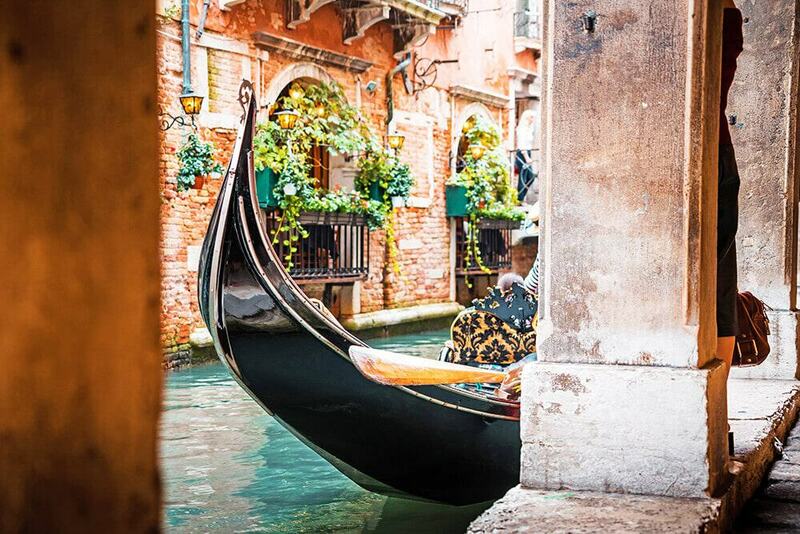 I have to add it to my Europe itinerary the next time I plan a visit there ? Good variety of activities to keep engaged. Love these beautiful photos! You do that! 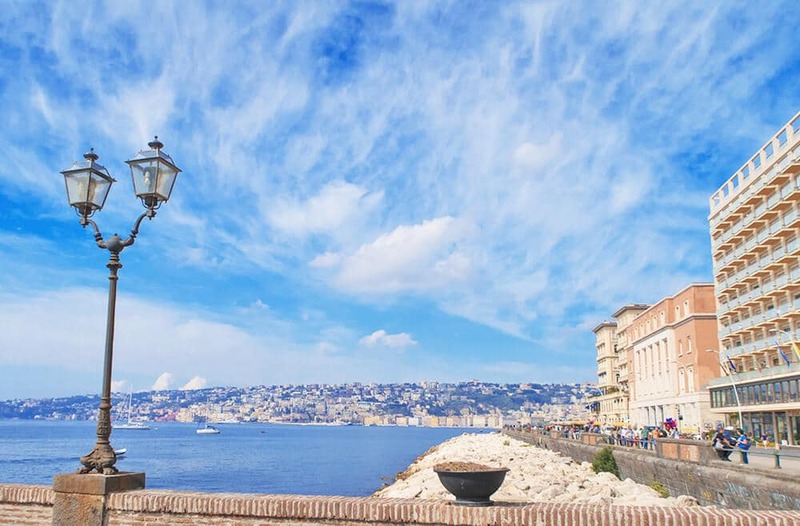 It’s pretty close to Italy, you could do a tour of the best beaches in Sicily and then just hop in Malta, it takes 1-2 hours to get there and it’s definitely worth spending a few days on the archipelago! Malta looks amazing! I don’t really know anything about it as a destination, but now I REALLY want to 🙂 that water is just to die for, and it sounds like you had a really amazing time exploring the culture and architecture, too. Thanks for sharing! I hope the post was useful and that you at least got to learn a bit about Malta 🙂 I had a lot of fun! Loved Malta absolutely. Traveled to the island in 2015 with a bff. I am so sad to hear Azure Window collapsed last March. When we were there, people were still walking on it, disregarding the signs! I loved all the landmarks: Mdina, Valetta, Ramla Bay, etc. How awful! I also couldn’t believe my eyes when I saw people walking on the cliffs, ignoring the signs, just to take pictures. This is SO dangerous and disrespectuful of the environment. I wish people would stop being so self centered! Yay! I also went in June! It will be very hot but as I mentioned, I found water and slushies to be VERY cheap if compared to other places! Do you have an itinerary as well? I’m sure you’ll fall in love with Malta! Interesting to know that in Malta as well they have processions where the carry the idols around. It seems to be such a universal ritual – almost all religions have this. I did not know Game of Thrones was shot at Malta. I hear a lot of films get shot at Malta. Yep Malta is a quite popular location when it comes to filming movies. Game of Thrones filmed intensively there for the whole first season! The Blue Lagoon was definitely my favourite part of Malta- I’ll never forget the incredible hue of that water!! Love that the country is still off the beaten path- it blows my mind frankly, considering how much it has to offer travellers. Did you visit the Blue Lagoon on a boat or on the white sand beach? And gosh I know the feeling, lots of people even go to Malta *just* for the English courses. There’s so much they can offer! I want to visit Malta soooo badly!!! Valletta sounds like my kind of place with the explosion of colours and beaches. Valletta is SO beautiful but make sure to visit Gozo as well! These are fantastic photos. I would love to vistit Malta someday, thank you for sharing! Thank you very much! I hope you get to go, but don’t forget also Gozo and Comino, they’re worth a day trip too! Do let me know if you go, I’d love to hear your opinion on the area! A place with wonderful old World charm. Great for heritage lovers like me. Oh you’d definitely love it! Game of Thrones, Blue hole, 3 Unesco world heritage sites…you’ve got me. I have read that Malta is one of the least visited countries and one for the cheapest European destinations. I know I would love it. Thanks for sharing such a huge amount of fun stuff to see and do. Right? I couldn’t believe my eyes! In Europe I found Poland to be cheaper than Malta, but I was totally surprised to see cheap prices in Malta right next to world famous beaches. Anywhere else you would’ve found high price tags, but not here. The restaurants can be cheap too and the servings are large, so yes, it’s definitely worth a visit because it wouldn’t be as expensive as one could imagine! A really useful post! I went to Malta ages ago and it’s a beautiful place. W liked Mdina the best. But I wish we’d got to Gozo and seen the Blue Lagoon too. You’ve got some lovely photos. Mdina is such a charming little town!!! I wish I’d stayed more there, too! I visited Malta when I was a lot younger with my parents and can’t really remember it very much! Now after reading your post and seeing your photos it really makes me want to re visit, especially for the Game of Thrones locations! Oh you wouldn’t be disappointed at all!!! I haven’t been (yet!!) but it looks amazing and I’ve only heard good things. Your great article (love the pictures!) makes me want to go even more, now! Thank you! I bet you’d have so much fun and it’s not even as expensive as one might expect! Haha did they ever tell you about their beautiful Island? The Maltese are so warm and welcoming, they made us feel right at home! Thank you, I’m very glad you found this useful and I hope you’ll get to see Malta too! The Blue Hole diving spot looks aaamazing! Had no idea about the GoT locations either. Will definitely have to pay Malta a visit on our tour of Europe. It does! I’m not a diver and it’s the first time I’ve regretted never taking diving seriously: I think that swimming down the Blue Hole must be a magical experience! As for GoT, a big part of the first series and some of the second were filmed there! There are other GoT spots also in Croatia and Northern Ireland! Ooooh will you get to Malta to then? Do you already have a plan? I love how colorful the houses are! That blue lagoon is a stunner! Beautiful!! I’ve never visted Malta but it’s always intrigued me. This brings back childhood memories of a book report I did on Malta. I think is is time for a visit. Love this post! 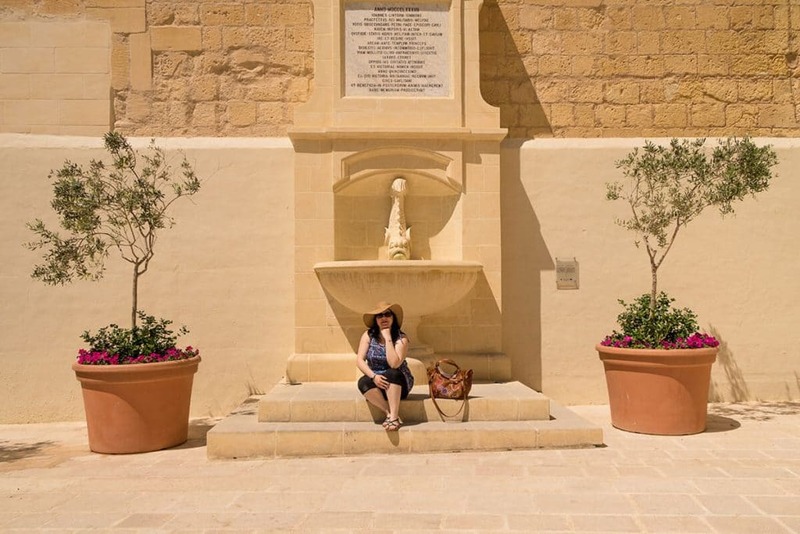 We’re Game of Thrones Fans so we’d love to see Mdina! After this read it’s on my bucket list! A pretty place. Malta is absolutely stunning! Hopefully I’ll get there one day! It really is! And honestly I looked into it and planning a trip there isn’t nearly as expensive as I thought! Love this!! This looks like such a scenic place. And I did a double take when i saw the isle of MTV. I rhought i didn’t read it right but I had no idea they did that!!! You wouldn’t expect such a pearl in the Mediterranean, right? I have no idea why Malta is so underestimated, it has so much to offer! And yes at first the Isle of MTV was itinerant, but it’s been a few years now that they have just left it in Malta. People loved it so much that MTV decided it was going to be a Malta exclusive. There were at least 50.000 people dancing and having fun, it was insane! And there were no accidents because security was great and the people attending were very careful not to push too much. What a beautiful evening! Your beautiful photos and inviting descriptions of Malta, has me yearning to go! Thank you very much! I’m just an amateur so this is a great compliment! I enjoyed the range of activities you covered in this post; from the ancient day to the modern music festival. It seems like this small island truly has something to satisfy everyone and with gorgeous weather and scenery too, it’s a win-win! I’ve not been to Malta yet and I will definitely add it to my Europe exploration plans! Thank you very much Meg! I always try to cover more aspects of the same place with my posts because I hope they can be useful to people who are looking for specific information to plan a trip. I also look for info online and sometimes I grow tired of reading articles that just don’t say anything specific or that are so short that they leave you with a “what did I just read?”! Yet I have to admit that I find it much more difficult not to write lengthy articles because more often than not I’m just enthusiastic and so I want to write everything at once. 😀 Malta is one of those very underestimated pearls that fueled my wanderlust. There’s so much to do, people are welcoming and warm, and whatever your flavour is, you’ll probably find the way to have fun. I’m glad I managed to convey it with my article! And I hope you get to go there too! If you have doubts or need more specific info don’t hesitate to contact me, I’m glad to help! Loved everything about your post and it made me travel back in time to 3 years ago when I spent a acation on this beautiful island. Your pictures are absolutely lovely! You’ve been there, yay! So what did you like the most? I’m so undecided, everything looks wonderful, people are welcoming, the water is perfect and the food is delicious! I’m also glad you like my pictures! I’m not a professional but I’m trying to improve and study photography! Oh well, to be honest, the thing I liked most was the island itself, the history, the buildings, the streets and of course the incredible water! I am in favor of any place that has boating ice cream vendors. The history for this region sounds really fascinating. I’ll be adding this to my bucket list! Haha I want boating ice cream vendors even here in Capri and Ischia! And it was so cool, I couldn’t believe my eyes when I saw them! They hand over this menu attached to a little lifebelt in case it falls down in the sea, you choose your flavour, order and get your ice cream. It’s that simple! Im loving all the blues!! 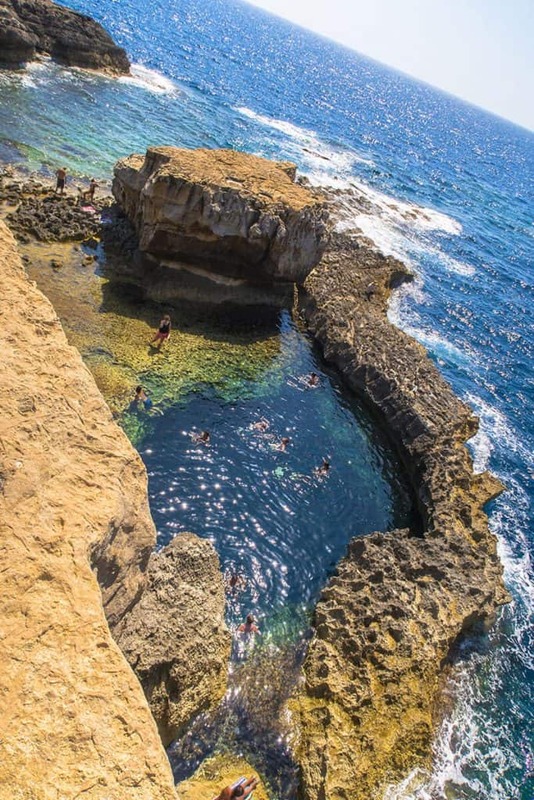 The azure window, blue hole, ramla bay, and lagoons all look like a dream!!! Maltas definitely at the top of my list! It’s lovely indeed! I hope you get to plan a trip over there soon! Have you already planned a trip over there? I just got back and I’d go again right now! I also think Gozo is this little fantastic realm, even lesser known than Malta! In fact there weren’t many tourists over there, maybe that’s why I loved it so! I’m glad you found this useful, thank you! Your photos, especially of the architecture, really make me want to visit. I’ve long thought about going to Malta for that historical aspect. The beautiful coastline and lagoons also look amazing! Thank you Kavita! I’m not a professional photographer but I’m working hard on my photography skills so this means a lot to me! 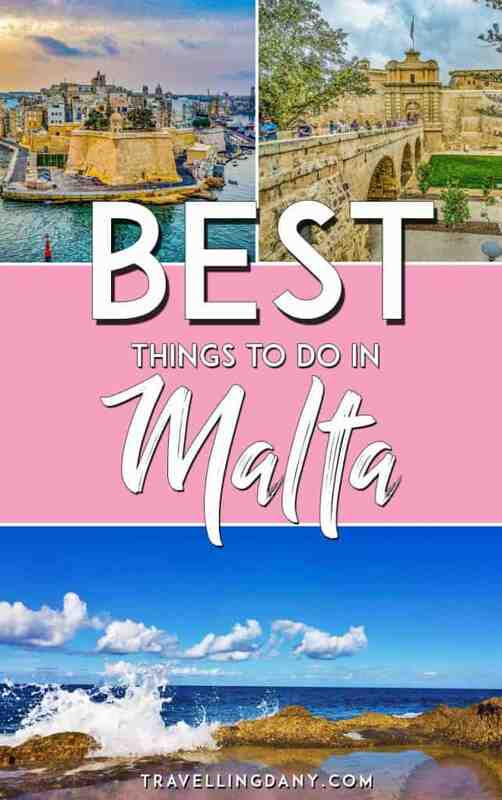 I also love to explore areas rich in history and thus I bet you’d love Malta because wherever you go you’ll find some beautiful monument, church or temple ready to surprise you! I have no idea why it’s so underestimated but you’re not alone! I also thought at first that it wasn’t that special… until I got to explore it with some local guides. Maybe that’s the reason why, a lot of people just go and stay in Valletta, which s beautiful, but there’s so much more than that! I am DYING to go to Malta. As a diver, that water looks so so perfect! You know I don’t dive and yet seeing the Blue Hole and hearing the guide talking about it I regretted being too scared to try! There was a diver in our group and she said it was amazing. I just can’t imagine how beautiful it has to be to see the hole from underneath and just swim hear the reef with so many fishes, finding your way through the caves, seeing the stone arch… what an adventure!!! Oh thank you SO much! I’ve just added it to my bucket list because I didn’t know anything about ghajn tuffieha and thus I missed it! The perfect excuse to get back! Did you also get to explore the lagoons? I’m still in awe, as I honestly couldn’t believe my eyes, it almost didn’t feel like the Mediterranean, I’ve seen that kind of blue water only in Hawaii! We didn’t get a chance to visit the lagoons. An excuse to go back to Malta! Spent a fair amount of time eating! Lol. I noticed that the water is sooo blue too! Thank you very much! I hope it can be useful and wow… how lucky! I’d love to talk to her too! One thing is to see the islands as a traveler, and another to live there! How is she liking it? People seemed so friendly and welcoming! Such a beautiful place ! Pictures are really good ! I’m really glad you like them, thank you! Am your youngest follower ( am only 8) ! I learnt about Malta while solving a map on European countries, placed so away from the rest, that sets it apart. Loved all your pictures ! Hey welcome aboard Mehr! I’m so glad to have such a young traveler with us! Malta is absolutely beautiful, and because it’s set slightly apart from the rest, often travelers thend to overlook the islands. Let’s hope this changes, it’s such a lovely place! I’m also very glad you liked my pictures, you’re so sweet! Such beautiful pictures. I love Malta, thanks to your post. 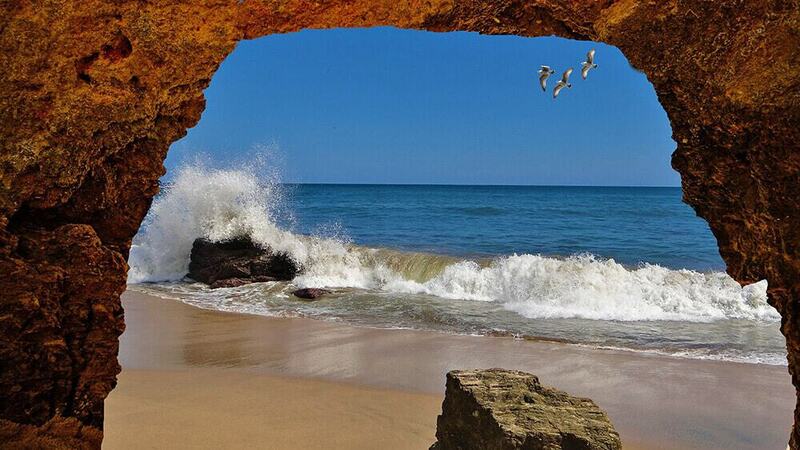 I must add Ramla Bay to my list when I go there – lovely capture. Thank you very much! I also want to point out that I didn’t use any filter, as people couldn’t believe their eyes in seeing the orange sand! Imagine my face when I first went there, it was surreal! Where it’s dry it looks more golden, but if you move towards the sea it becomes almost red. It’s fantastic! I’m also trying to find all the GOT spots!! Hubby is a huge fan! I think the ones in Northern Ireland are also particularly beautiful! I love how everything looks so golden and sand coloured in Malta – goes perfectly with that stunning blue water! I’m actually visiting next week so this guide was right on time for me 🙂 thanks! Yes! I’m a very colorful person and I felt so happy, it was like being in a rainbow! Have a safe trip there and if you can, when you get back let me know how you liked the islands, I’d love to have your opinion! Thank you very much Kristine! I’m not a pro so this is a huge compliment! You can monitor flights with Skyscanner, but I think Air Malta, Ryanair and Easyjet have the best fares! I was honestly surprised to realize that the prices were so low. In some touristic places in Italy you’d pay 4-5€ for a slush, while you got to pay 2€ in Malta. Same with water, they could’ve charged it a lot more and yet they didn’t. So yes it’s a little paradise that still offers cheap prices and great views! I hope you get to go there soon! Yes! I have no idea why it’s so underestimated, to be honest! It’s a little paradise and much less expensive than other sea destinations in Europe! Thank you for stopping by! Malta looks so beautiful! I have been wanting to see Mdina for a while now- but this post made me realize how much more Malta has to offer- thanks for sharing! Walking through the narrow streets in Mdina at night feels almost surreal. It was quiet, romantic and particularly beautiful. I think it’s one of the places that made me fall in love with Malta! I hope you get to go soon!